Proud as a peacock. That common saying neatly sums up the majesty and beauty of the male members of the peafowl family. 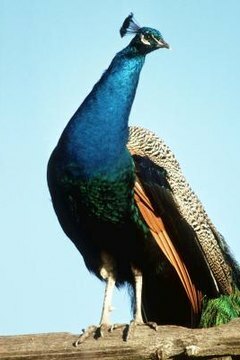 The most exotic-looking member of the pheasant family, much of the peacock's habits revolve around impressing the far less attractive peahen. The females, plain and brown, receive court from the brightly plumed and colored peacocks. Peahens prefer a guy with a long, colorful, gorgeous tail. The more eyespots on the tail, the better the peacock usually does with the girls. That tail makes up over half of a peacock's body length, which he uses to great effect in his courting rituals. In nature, each peacock accommodates up to six peahens as mates, with each peahen laying three to five eggs annually. According to National Geographic, wild peafowl gather together in groups called parties, a suitable name for the social life of these stunning birds. As omnivores, peacocks eat plants, berries, seeds and insects. While domestic peafowl consume commercial feeds designed for their dietary needs, wild or free-ranging peacocks eat just about anything, including small creatures such as reptiles and amphibians. If you're raising chicks, the United Peafowl Association recommends feeding them a game bird starter mix and keeping them supplied with greens. Cabbage heads are a good choice, as they can keep chicks occupied for quite some time. It's important to worm all peafowl at least twice a year. If you don't have a guard dog, peacocks can make a decent substitute. They'll let you know whether anyone's on your property with a series of loud, distance-carrying calls. Before you let your peacocks free range, keep them penned up for several months so they know where home is. That's the advice of the United Peafowl Association, which warns that letting peafowl loose before they're accustomed to a particular location usually ends with the birds becoming semi-wild. On the plus side, acclimate them and you've got watch birds. Peacocks don't like mixing with the hoi-polloi of other common fowl. That goes not just for chickens, ducks and turkeys but also other members of the pheasant family. If you keep various types of fowl, house the peafowl separately.